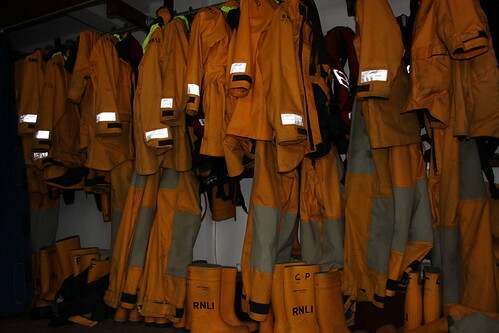 Wandering around a lifeboat station with a camera, one of the first things you notice is quite how many things have reflective strips sown, stuck or otherwise attached to them. This is a little annoying when you’re trying to get the perfect photo with just the right amount of flash, but if you happen to be out on the sea in the middle of the night, this can – quite literally – be a lifesaver. In between my Dad being a Deputy Divisional Inspector for the RNLI and being promoted to Divisional Inspector, he worked as a Staff Officer at the charity’s headquarters in Poole. He wasn’t a great one for being in an office, but his broad responsibilities – his official job title was ‘Staff Officer (General Duties) – meant that he was able to spent most of his time out and about. To the general relief of everyone, I suspect. One project that he got involved with was the redesign of the lifejackets for the crews of the RNLI’s inshore lifeboats. He attacked this task with gusto and our living room at home was soon full of all kinds of different lifejackets. This was in the era when self-inflating lifejackets with carbon dioxide cartridges were just coming on the market, so there was quite a variety on offer. In addition to various commercial products, he somehow managed to procure an example of the lifejackets used by the Royal Marines. This was a rather sleek piece of kit, in a highly stealthy olive green colour. This didn’t impress my Dad, though, because he was interested in visibility. 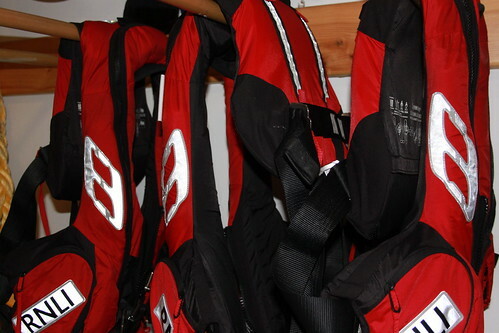 And, unlike the Marines, he wanted his lifejackets to be as visible as possible. Key to this was getting the right reflective material, the strips that would be sewn or stuck onto the lifejackets themselves. I remember that my Dad spoke with various manufacturers and was soon sent a number of samples of different reflective materials. Some were the more traditional silvery ones, another was fluorescent yellow and one was a weird (and supposedly luminous) white colour. Determined to do the job properly – if not entirely scientifically – my Dad attached a strip of each material to a large piece of plywood. And then, one dark evening, he (with enthusiasm) and I (with a little less enthusiasm) traipsed off to the area of heathland not far from our house. Once we were away from the glow of the streetlights, I was dispatched into the darkness several hundred metres distant. I then held the board with the reflective strips aloft above my head and my Dad zapped me with his new million candlepower spotlight. As I struggled to keep this enormous chunk of wood balanced in the air, all I could hear (between flashes of the spotlight) was his less-than-polite requests for me to stand still and to stop waving the board around. After a while, he decided that we needed to assess the reflectivity of the materials at greater distances, so I was instructed to walk away into the deeper darkness of the heath until he yelled ‘stop’. This continued for some time until it seemed like I was about to arrive in the next village. But eventually it got a bit cold and my bedtime was approaching (I was about thirteen at the time), so my Dad decided to call it a night. So that was my introduction to the importance of having the right kit for the RNLI’s lifeboat crews. It’s not good enough for things to just be okay or to be good enough. They have to be exactly right. They have to be the very best that they can be. Because whether it’s the lifejackets themselves or the reflective material on them, one day someone’s life could depend on the choices that you have made. This entry was posted in Stories from the past and tagged RNLI, The Lifeboat Crew by Simon Perks. Bookmark the permalink.